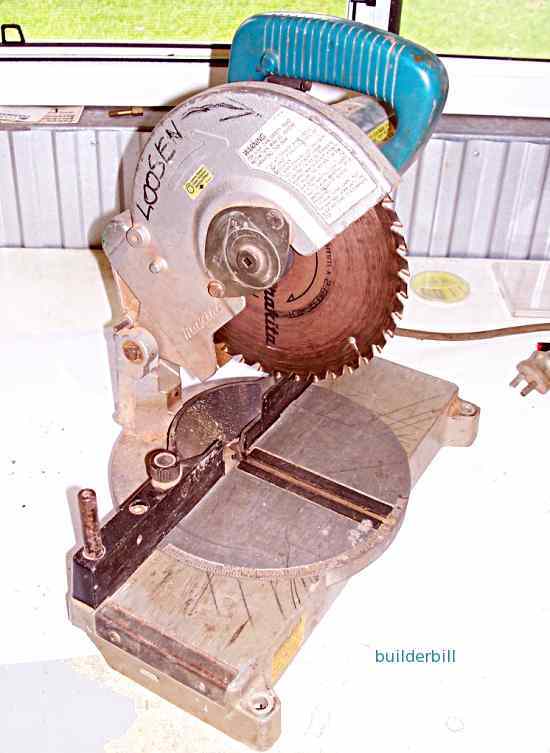 Named after the mitre joint that it commonly makes these saws sometimes called drop saws or chop saws are used to make cuts across the length of pieces of timber. 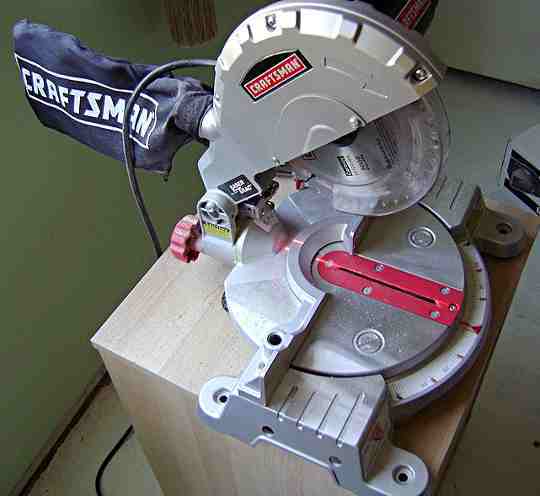 This is a typical small drop saw used as a portable tool, easy to carry from place to place when cutting baseboards, skirting, architraves etc. The blade size on this one is 225mm and to be expected it has fine teeth (TCT) shaped for cross-cutting. From the above stats it is easy to see that when the machines like this are set at 45 degrees than they have a lot less cutting capacity. Further it will only cut that size when it is swung to the left. To swing to the right it won't do a full 45 degrees as the motor gets in the way of the back fence. This is not as bad as it seems as most times when a miter is needed on both ends then it is possible to rotate or spin the work between cuts. Larger versions of the same type of saw come with 355mm blades and as they are quite a lot heavier they are more suited to bench mounting. Another small power miter saw this time with the dust bag. 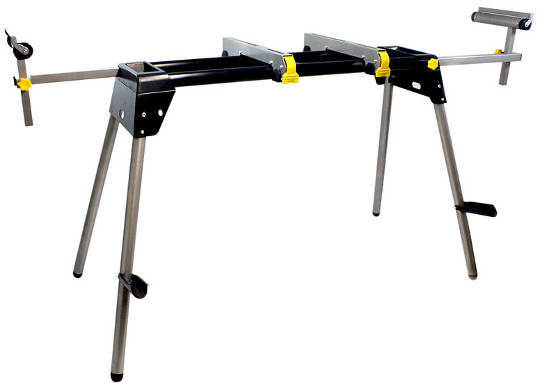 The distinction between bench mounted and portable has changed over time because of the introduction by many manufactures of portable and or movable saw bench stands. (Some have a set of wheels). This gives another facility to these saws as it makes it easy to set up bench stops and other aids for repetitive cutting. Note on the guard casing the arrow. This indicates the rotation of the blade. It also indicate the way the the center nut spanner has to move (when the blade is locked) for removal of the blade. 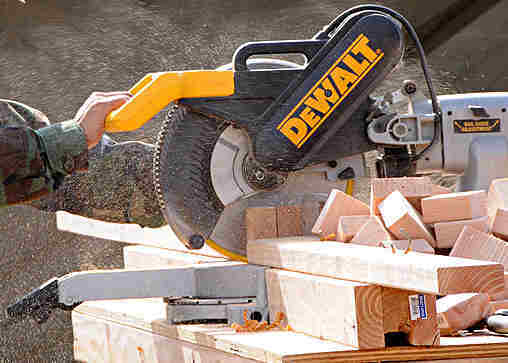 In the above shot we see a collapsible mitre saw bench. The saw in set in the middle and long ends of material are supported on the rollers. This is just about what I have used on site many times over the years. I set up a couple of saw horses and a couple of long planks. Then sit the power miter saw on it and screw it down solid, then add packers (off-cuts of the material being worked).